Ghent is a compact, authentic city where the past and present co-exist in perfect balance. Walking through the city is like travelling through time: you turn the corner and just like that, you go from the fourteenth century to the twenty-first. In Ghent pounds the young heart of a cultural city filled with music, theatre, film and visual arts. Because of its central location in Flanders, Ghent is an ideal operating base to visit the Flemish Art Cities. Ghent is ready to welcome you with open arms! Emergency numbers: 112 is the general number used in all countries of the European Union to contact the emergency services: police, fire brigade or medical assistance. The number operates 24 hours a day, 7 days a week. Opening hours: 7/7 - 10 a.m. - 6 p.m. The vibrant city of Ghent is more than worth a weekend trip. Ghent offers you a quirky, fascinating cultural cocktail brimming with rich history, culture and a trendy city vibe. Ghent is a chilled-out city where anything goes: a city break on a human scale. Take a look at all the sights in the vibrant city of Ghent. There are so many must-see attractions to visit on your holiday. You’ll be spoilt for choice in Ghent! Choose. Do. Start your city break by visiting the heart of Ghent: the historic centre. This city walk takes about two hours. Absorb the mystery: follow your guide to the Castle of the Counts, the Graslei and Korenlei and Ghent’s famous Three Towers. Let your eyes drink in the modern architecture of the City Pavilion and the rustic charm of the Patershol, an old neighbourhood with mediaeval streets full of restaurants. Join the sociable Ghent residents and enjoy life. East Flanders has more than 175 traditional regional products. And in Ghent you can find them all handily displayed under one roof! The Great Butchers’ Hall houses the Centre for East Flemish Regional Products. You will find everything here, whether you want individual products or a gift hamper. Or why not put together your own delicious gift? If you can’t wait to taste our specialities, reserve a table at the restaurant across the aisle and enjoy local dishes right there on the spot! The Great Butchers’ Hall was originally a covered market. This hall, which dates back to the 15th century, was the central place where meat was inspected and traded. This was partly because selling meat door-to-door was forbidden in the Middle Ages. 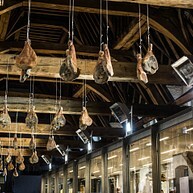 Delicious Ganda Ham is now hung up to dry in the magnificent exposed wooden rafters. This ham is still salted and dried by craftspeople following an age-old traditional recipe. You might want to experience Ghent on a miniature scale as well. Beside the Great Butchers’ hall is the smallest pub in Ghent, ’t Galgenhuisje. This vibrant little café used to be one of the tripe shops. Animal entrails were sold in these huts, separated off from the market hall for reasons of hygiene. The little bar fills up quickly. But not to worry. There is plenty of room on the terrace, and it’s heated in winter! This particularly beautiful corner of Ghent is a city within the city. Forget where you are for a moment and travel back in time to the Middle Ages. Have fun discovering centuries of history in this gorgeous part of town! Breathe in the nostalgia of old customs. Enjoy art and architecture. You will love the picturesque streets full of cosy restaurants, down-to-earth pubs and trendy bars. Ghent is heaven for foodies. But the Patershol is definitely at the top of everyone’s menu. Eateries are almost shoulder to shoulder in these tiny cobbled streets. Take a culinary trip around the world from Japanese and Indonesian food, past Turkish, Italian and Spanish restaurants to traditional Flemish cuisine. Pick your style, whether it’s modern, romantic, a bit eccentric or exclusive. You certainly won’t be leaving with an empty stomach. Real people live their lives in the shadow of the Castle of the Counts. Residents here go about their daily business. They welcome neighbours through their doors. Children play in the street. The Patershol is more than a tourist hotspot. Above all, it is a place where people live. There is a festival committee that honours local traditions. All of this gives the mediaeval streets a unique historic value. Wander down the narrow alleyways and experience the real soul of the Patershol. The STAM is the ideal place to start your cultural holiday in Ghent, an unmistakeably contemporary building against a historic backdrop. Ghent is a city of every era, and the same applies to the modern Ghent City Museum: the 14th-century abbey, 17th-century convent and new 21st-century building all form part of the STAM. The STAM tells the story of Ghent from the Middle Ages to the present day, with imaginative collections and interactive multimedia. The past, present and future of the city are presented in a clear and interesting way: from mediaeval metropolis to city of knowledge and culture. The eye-catcher at Ghent City Museum, the STAM, is a gigantic aerial photograph of Ghent (measuring 300 m2!) that you are allowed to walk all over. Use the multimedia app to see Ghent in detail in four different centuries. ‘Views of Ghent’ shows a view of the city in 1534, maps from 1614 and 1912 and a contemporary aerial photograph. This Benedictine abbey was founded in the 7th century by St Amand, who christened the very city of Ghent itself. In the 14th and 15th centuries, it grew into nothing short of an abbey village, with farms, gardens, homes and estates. The abbey owed its prosperity to the privileges it had gained and the taxes it was allowed to impose on its estates. It owned land all the way to the port in Ghent. The virtual monk ‘Alison’ will give you a virtual tour of the abbey. ‘Jean-François Alison’ is your mystery movie guide during your visit to St Peter’s Abbey. In seventeen episodes, he takes you on an exciting and mysterious journey in search of his friend’s murderer. He takes you to places you would never otherwise go. The mediaeval dining hall, the majestic abbey church, a beautiful garden and endless attics: you will stumble from one surprise to the next, between heaven and earth. It is really thrilling, and suitable for children as well. Why not take a virtual look at St Peter’s Abbey now? The garden of this abbey is a real hotspot in Ghent that is particularly popular with the city’s students who come here to chill out or revise in the sunshine. A must-see during your city break. The magnificent garden with its vineyard and ruin is an oasis of greenery in the city. Prestigious exhibitions with an international allure are held every year in St Peter’s Abbey. The dining wing of St Peter’s Abbey is authentic, dating from the Middle Ages. Visit the ground floor of St Peter’s Abbey for free (cloisters and quadrangle, as well as the permanent exhibition Between Heaven & Earth and the abbey garden). The Citadelpark is a park in Ghent on the brow of a hill between the rivers Scheldt and Lys. This city park was created in 1875 on the place where the Dutch citadel of Ghent formerly stood, built between 1819 and 1831. The citadel, one of the largest and most modern in Europe at the time, was later used as an infantry and artillery barracks. It was in use until 1870. Today it is a great place to enjoy botanical abundance. Spot the name tags that were placed in front of all the remarkable trees in 2005. Here, animal-lovers can take dogs from the rescue centre for a walk. Kids aged 10 and under can have fun in the playground. When the sun is shining, this spot is where Ghent residents and students come to chill out and have a picnic. Enjoy! Opposite the Castle of the Counts on Sint-Veerleplein lies the monumental gateway (1689) to the Old Fish Market. Neptune keeps watch over the Scheldt (male) and the Lys (female). This fully refurbished complex is home to, among other things, the Ghent Tourist Office: the showpiece of the office is the centrally located multimedia data table. Through innovative touch technology information can be obtained about Ghent, East Flanders and other art cities. This architectural work of art is a unique meeting place for residents, students and visitors. You can meet other people there, discover culture, enjoy a quiet drink or even try out innovations and technologies like 3D printing and virtual reality for yourself. As well as connecting people, the building links the Historic Centre with the Art Quarter. Various institutions work together and offer services at the site. They are known collectively as ‘the inhabitants of De Krook’. 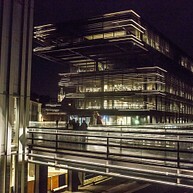 In addition to the city library, Imec (the Flemish research centre for nanoelectronics and digital technologies) and UGent are housed at De Krook. The building also includes a multi-purpose room, a study room and a reading café. The monumental building, which incorporates works by artist Michaël Borremans, was designed by the Ghent architecture firm Coussée & Goris Architecten and their partner TV RCR Aranda Pigem Vilalta Arquitectes. This Spanish architecture firm also won the Pritzker Prize this year, the highest international distinction for architecture! A weekend trip to Ghent is simply not complete without a visit to the mysterious ‘Castle of the Counts’. This important sight in Ghent is a castle with a very turbulent past, closely intertwined with the complex—often stormy—political and social history of the city. It is the only remaining mediaeval castle with a moat and largely intact defence system in Flanders. Your visit to the Castle of the Counts will give you a complete picture of heraldic culture in the 12th century. The gatehouse, ramparts, keep, count’s residence and stables are open to visitors. Be sure to go up the long spiral staircase to the museum of torture devices on the top floor of the Castle of the Counts. Here, you will find a unique collection of instruments for torture and coercion, as well as a collection of weapons. The Castle of the Counts also hosts all kinds of cultural activities, events and activities, for example during the Ghent Festivities. It is also a popular place to get married for Ghent’s locals. Let’s not forget the time the Castle of the Counts was occupied by protesting students in 1949! Explore the castle during your weekend trip in Ghent and find out all about the ‘Battle of the Castle of the Counts’. The keep, symbol of the Counts’ power Go back in time inside this majestic fortress. Its history goes back to the time of the Roman occupation, when there was already a settlement on a sand bank by the River Lys. After a brief period of Viking plundering, the Counts of Flanders converted the earlier wooden constructions into a keep (living quarters) in the Middle Ages, with ramparts built entirely of stone, replete with 24 towers. 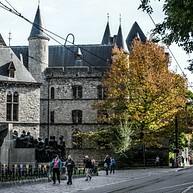 The imposing building with its military architecture was a symbol of the Counts’ power in the turbulent city of Ghent. Count Philip and his castle: dominating the city Count Philip of Alsace wanted everyone to know that he was the boss. A Latin inscription above the entrance states that Count Philip (1168-1191) built the castle in 1180. The sense of wealth and power that his castle gave him is brought to life when you stand between the battlements at the top of the keep and gaze out over the vibrant city of Ghent. 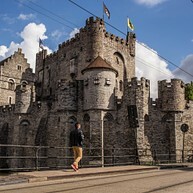 Industrial revolution banishes knights from Ghent You are bound to be fascinated by the twists and turns in the story of the Castle of the Counts during your weekend getaway. In the late 18th century, the Castle of the Counts was sold to private owners who later converted it into a factory complex. In 1807, the fortress in the heart of Ghent housed a cotton mill, and its outbuildings served as primitive dwellings for about fifty families of workers. When the mill and its workers left, the Castle of the Counts was in a state of complete disrepair, ready for demolition. By that point, the Castle of the Counts was a symbol of abuse of power, feudal repression, horrific torture methods and a cruel inquisition as far as the people of Ghent were concerned. Restoration gave the Castle of the Counts a new meaning and world fame as Ghent’s most important tourist sight, partly due to the World Expo 1913, which took place in Ghent. Do you want to dig deep into the history of Ghent? This is where you need to be. Ghent, full of charming history and modern vibrancy. A Sunday morning on the Kouter means a pleasant stroll around the flower market, stopping now and then for a klapke: a glass of white wine with an oyster. Bask in the elegance of life in Ghent. And why not enjoy a relaxed bite to eat at one of the great restaurants nearby. It is a favourite ritual for Ghent residents. You don’t need to wait for spring! Thanks to the daily flower market, you can see a bright tapestry of flowers every day of the year on the Kouter. But the best time of all to visit is on a sunny Sunday morning in spring. Stretch your legs in the first rays of spring sunshine, enjoy the colours and listen to music playing in the background. Blissful. If you’re lucky, a brass band will be playing in the bandstand. This is what we call the good life. Ghent’s most sophisticated gourmets gather at De Blauwe Kiosk at about eleven in the morning. This monument converted into an aperitif bar serves a glass of cava, fresh oysters and other amuse-bouches to connoisseurs at the market. Originally a hexagonal newspaper kiosk, this little building has stood on the Kouter since 1885, along with 38 other kiosks around the centre of Ghent. Today this one is the only survivor. 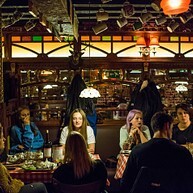 Since 1990, it has had a new lease of life as an open-air bar. 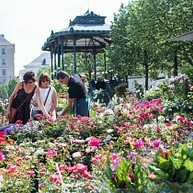 There is more here than just strolling, flowers and wine! The Kouter is also a hub of music. There is something here for everyone! The 19th-century Opera Gent building and De Handelsbeurs concert venue on the Kouter span the entire music scene, from pop, rock and world music to jazz, opera and classical music. Perhaps running through the entire offerings would be a bit much. Simply rest assured that the Kouter is the place to be if you’re a music lover. The Kouter is the perfect place to start a shopping spree in the Veldstraat. Stretch your sea legs: the view of Ghent from the water is absolutely charming. Take a boat ride during your city break or weekend trip. 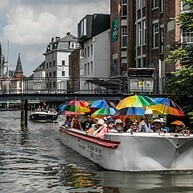 There are various boat tours organised on the rivers and canals in Ghent. Travel back in time. Immerse yourself in the city of Emperor Charles V and discover hidden secrets. Ship ahoy! Different boat companies offer enjoyable trips on Ghent’s gentle waters. Traditional boat trips are held daily. The captain on board provides a guided tour in several languages. During the weekend, Ghent also has a water tram that navigates in a circuit around the city. Jump aboard at one of the water stops. It’s free with the CityCard! Gentbrugse Meersen is a park and nature reserve that is still being created. You can come here for sports, play, gardening and picnics. Take a walk in the woods and discover stretches of open water populated by water birds. A piece of wild nature close to the city. The barefoot path is a 1-km long footpath that has not been laid artificially. It is a natural path which changes along with the weather and the seasons. A real treat for your feet! Lovers of contemporary art absolutely can’t afford to miss a visit to the S.M.A.K. during their weekend in Ghent. The Municipal Museum of Contemporary Art, or S.M.A.K. 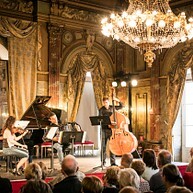 for short (in Dutch), was founded in 1999 and is located opposite the MSK in a former casino building. The city of Ghent is known for its rebelliousness, and its contemporary art museum is every bit as dynamic and unconventional as Ghent itself. 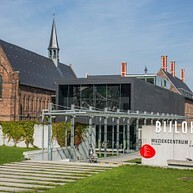 The collection is considered to be the most important collection of contemporary art in Flanders, with world-famous works of art from Belgium and abroad. Every four months, the museum exhibits a selection of these works in alternation with original, often daring exhibitions. Recover at leisure from the assault on your senses in the museum café. Take a look at the sculpture by Jan Fabre on the roof: the body of ‘The Man who Measures the Clouds’ is modelled on Fabre himself, but the face belongs to his dead brother. 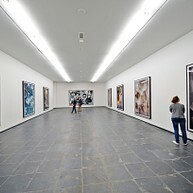 Under the inspiring leadership of the controversial curator and ‘art pope’ Jan Hoet, the former ‘contemporary art wing’ of the MSK was given its own museum, the S.M.A.K. The permanent collection at this museum for contemporary art includes top Belgian and international works of art by Cobra, pop art, minimal art, conceptual art and arte povera artists, who are now among the most famous artists in the world. 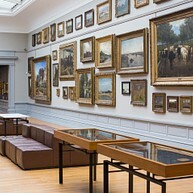 The strength of the Museum of Fine Arts (MSK) in Ghent, one of the oldest museums in Belgium, lies in the varied nature of its collection, which is nothing short of remarkable. Never before have old masters and modernists hung side-by-side so perfectly as in this iconic museum building. At the end of the 18th century, Ghent was under French rule and many of the city’s art treasures were seized. Some of them can still be seen in the Louvre in Paris today. Rebellious Ghent wasn’t having any of it, and slowly began to establish a wide-ranging art collection, searching for years to find an appropriate building. The ideal location was found in the building designed by the architect Van Rysselberghe in the Citadelpark, a temple to the arts with a fantastic feeling of spaciousness and a lot of light. The collection, which ranges from Hieronymus Bosch to Rubens and Magritte, has never been shown more attractively than it is today. It covers an enormous variety of paintings, statues, drawings, etchings and tapestries, from the Middle Ages to the 20th century. An auditorium, a library, a children’s workshop and a brasserie turn the MSK into a contemporary, multipurpose complex where you can spend many a pleasant hour surrounded by beauty during your weekend trip to Ghent. This bustling art centre is housed in an impressive 100-year-old monument and offers a variety of cultural events. The focus is on concerts and parties. The spacious Art Deco café and the modern patio at the side of the building are a meeting place for a snack, drink and chat. Music theatre, concerts and recitals In the first half of the 19th century, rich Ghent industrialists initiated the building of a new and luxurious opera house. It was meant to be the showcase for their newly acquired wealth and no expense was spared. In the splendid horseshoe-shaped theatre, being seen was just as important as seeing. The impressive chandelier is an attraction in itself, just like the three salons, measuring together 90 m long.